A combination of engineering mastery and business acumen, Vijay Jain is a serial entrepreneur. And is now a co founder and CTO in m-ad Call Digital Services Pvt Ltd. He is an Engineering Graduate and Masters in Advanced Computing, backed with 15 years of varied experience in the Wireless industry. Vijay has co-founded the successful startup Astute and worked to build an eco system through m-apps training, m-appsLab, and m-designguru. 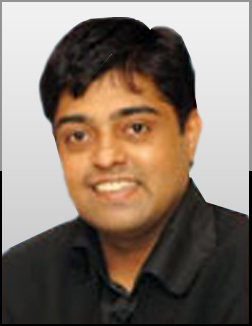 He started off in 1999 with Zenith Infotech, and then in IAP Tokyo in Japan. Vijay Jain is also credited for his leading the NTT Docomo’s R&D team to launch the World’s first mobile TV phone. Holding the technology backbone of the company, leading young people and large teams, Vijay has an easy-inclusive style of working and is truly a power house within the team.